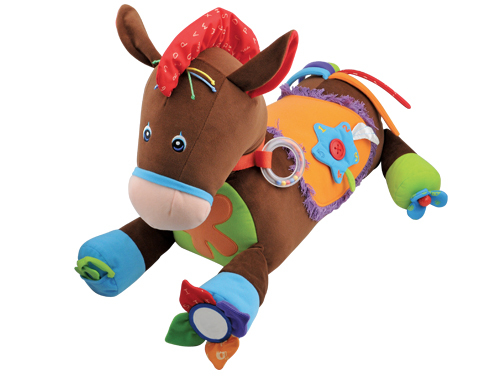 Tony the Pony is a big bundle of fun for your little one. 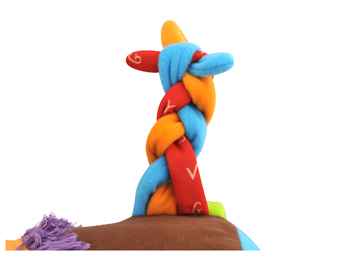 He whinnies, has crinkly, alphabet hair and a long, colorful tail. 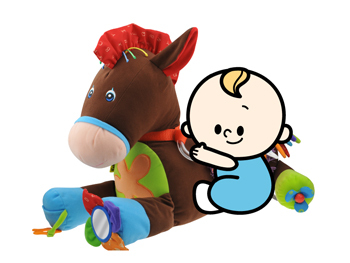 Your baby can hug him, ride on him, and stay busy with all the different activities: a mirror, teether, button, zipper... and much more! Method: All children learn to hug. 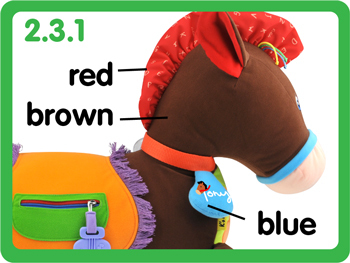 Tony the Pony is made from high quality materials. 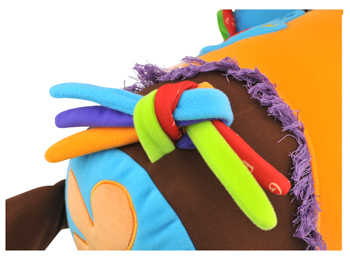 It is soft and comfortable, great for kids to hug. Hugging builds a sense of security and teaches them to care for others. 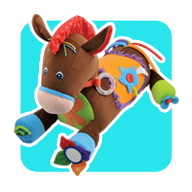 Method: Shake the rattles or pat the pony to activate sounds to attract your child's attention and observe her reaction to the sound. 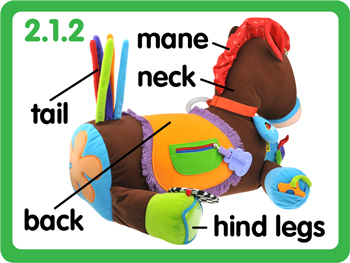 Method: The pony is made from different materials. 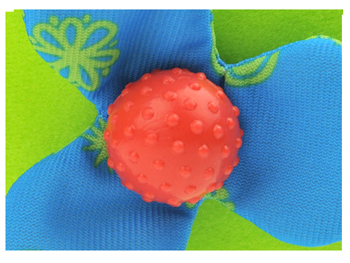 Encourage your child to touch and feel the different textures and to chew on the teether. 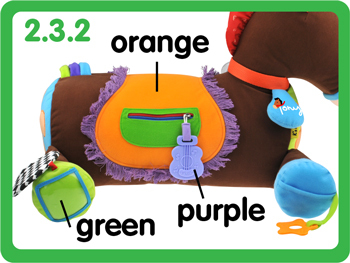 Method: Tony the Pony is made of crinkle paper, rattles and other small parts. 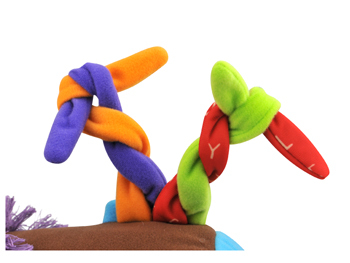 Encourage your child to grasp at and shake the different parts with both their right and left hands. 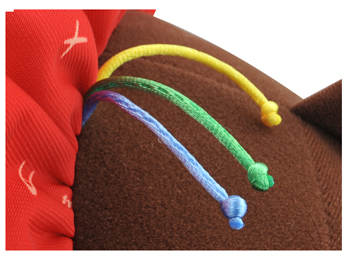 Method: Encourage children to zip the zippers and pull the pony tail with both their right and left hands. 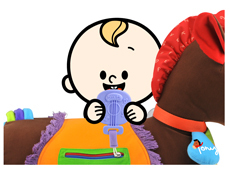 Method: Help your child sit on the pony. 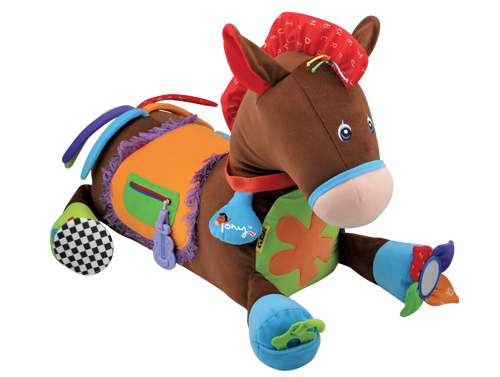 Encourage her to pat the pony to activate the sounds and to experience the joy of riding. 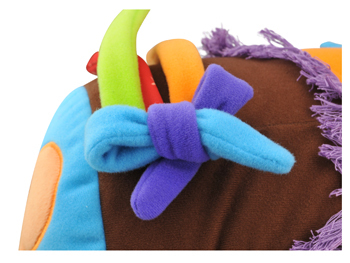 For safety, place cushions or mats on both sides of the pony. 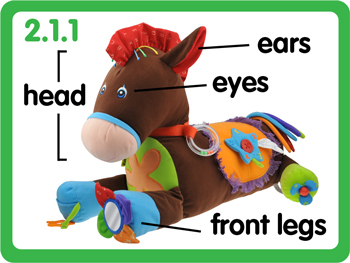 Method: Use the pony as a teaching aid to teach children to recognize animal body parts. 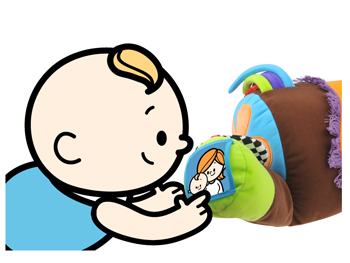 Method: Say a body part and encourage your child to point to it on Tony. 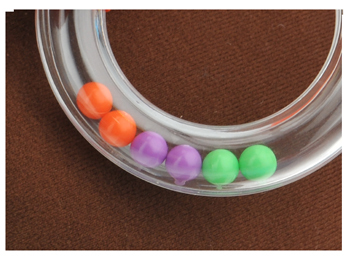 Method: Use the different colors on Tony to teach children to recognize colors. Method: Say a color and encourage your child to point to it on Tony. 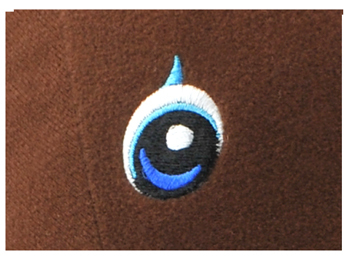 Method: Children can look at themselves in the mirror. 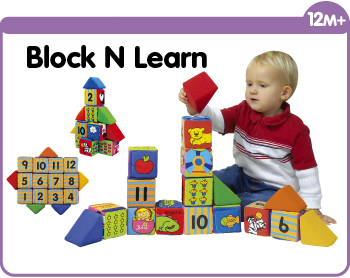 This helps develop their self awareness. 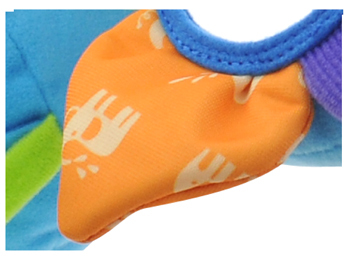 Parents can also place their child's photo or a family member's photo in the clear pocket. 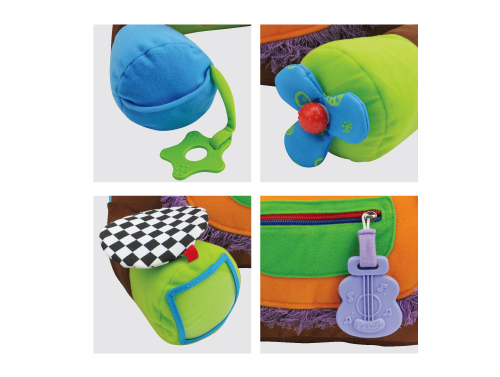 This helps the child recognize faces. 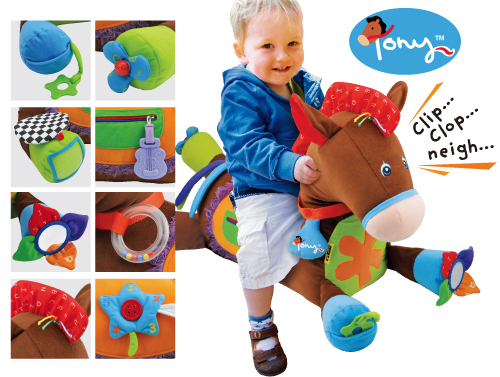 Method: Teach children to identify shapes using the shapes on Tony. Method: Say a shape and encourage your child to point to it on Tony. 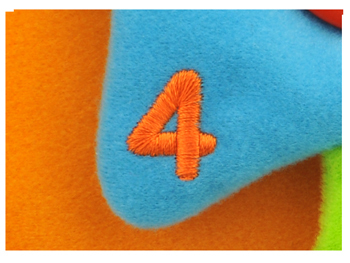 Method: Teach children to identify the numbers 1 to 5 on the blue star. 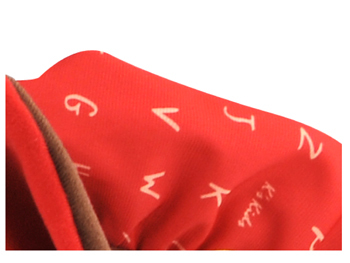 Method: Teach children to identify the letters printed on the pony’s mane. 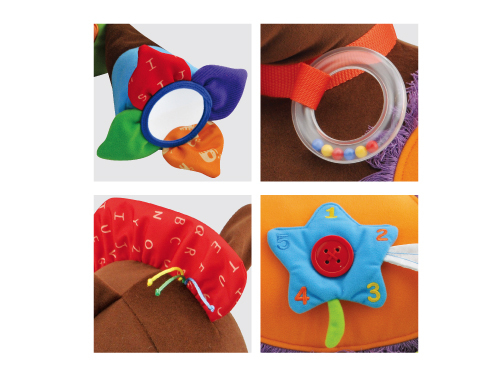 Method: The star shaped teether can be placed inside and outside of the pocket found on Tony’s front leg. 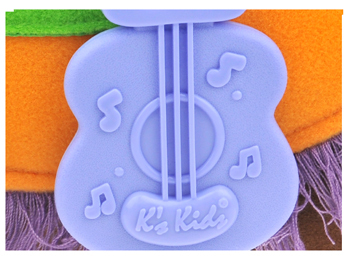 Use this to teach your child the concepts of “inside” and “outside”. 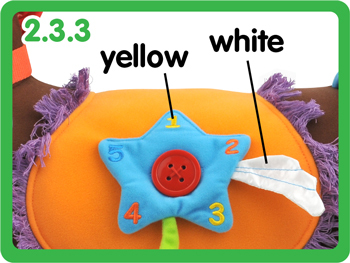 Method: Encourage your child to practice buttoning with the red button on the blue star. 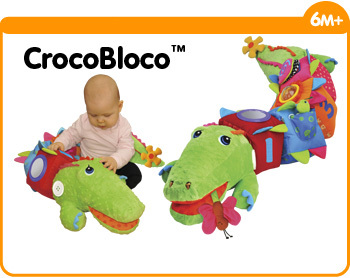 This trains her eye-hand coordination skills. 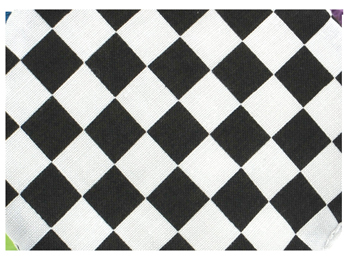 Method: Let children find which part of Tony the following photos depict. Parents can also take their own photos for this activity. 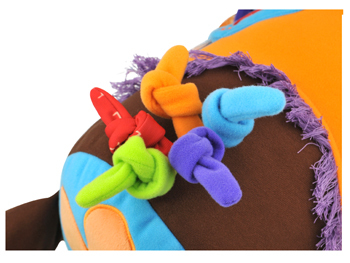 Method: Teach children to tie knots using the pony’s tail.